BAL Training Manager Dave Rowley has been recognised with a prestigious industry award for playing a vital contribution to the development of skills and knowledge throughout the tiling industry. 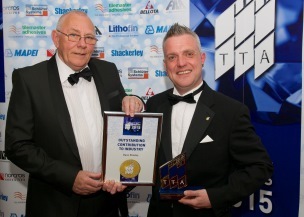 Dave, who joined BAL in 1992 after completing an apprenticeship in wall and floor tiling, was presented with the Outstanding Contribution to Industry award at The Tile Association Awards 2015. Alex Underwood, Head of Marketing, said: “Dave has been instrumental in helping to raise standards across the industry, developing and delivering modular introductory courses for new people entering the industry as well as structured and bespoke training courses on advanced techniques and product knowledge. Over many years Dave has developed and updated NVQs/SVQs and EWPAR qualifications and is a qualified assessor and internal verifier in wall and floor tiling. He also works with colleges and independent training providers to oversee product training in line with qualification structures. Since 2009 Dave has been the lead judge for the national SkillBuild finals for wall and floor tiling. Organised by the CITB (Construction Industry Training Board), SkillBuild provides an important showcase for trainees, and helps to improve workmanship and increase standards across the industry. Dave is an active member of the TTA Fixer Training Committee and is Chairman of the TTA Supply Chain Committee where is currently involved in a new initiative to standardise training for the supply chain, with a pilot project set to being in the near future. On receiving his award Dave said: “I am extremely passionate about training, which I believe is vital to the continued success of the company and the tiling industry in general.